I'm on a mission to improve my cardmaking. You can read about what I'm up to in this post. I hope you enjoy this series! Today, and in some later posts, I'm focusing on Yana Smakula. I love everything she makes. Period. 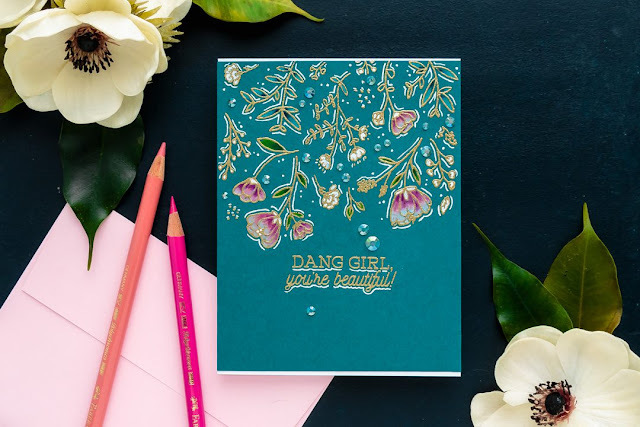 If you look through her blog or instagram feed, you'll see that Yana's cards are colorful, beautifully made, and often seem to sparkle. Her photography is outstanding. Yana designs for Spellbinders, Hero Arts, and Simon Says Stamp (among others) and I suspect she is responsible for selling a lot of products! In addition, Yana's you tube channel is one of my favorites. Her videos are clear, engaging and full of useful tips. Yana was kind enough to permit me to use her photos on my blog, so you can see right away how my card uses her ideas. Yana has several videos on using colored pencils on dark cardstock. Here's one card Yana made that is just stunning (as is her styling and photography). Coloring on dark cardstock is interesting, new to me, and looks elegant. It reminds me of Indian fabric. The flowers are perfectly and evenly placed. The gold is beautiful and the pops of white brighten the card. The jewels look like they belong there. The styling and photography are beautiful. The flowers are Yana's card are closer together, and she filled in the spaces between the flowers with more white dots and with jewels. That really added to the beauty of her card. I have too much empty space between the flowers. It looks a little anemic. That's an easy fix for the next card. Yana recommends Faber-Castell Polychromo pencils. I have quite a few Prismacolor pencils, and a handful of the Polychromos. I didn't see a huge difference between them, but I haven't used pencils in a while. I won't buy anymore Prismacolors because they break too easily, which is why I don't have a pink pencil. Using a pink pencil would have made the blending on this card easier. Note to self: add a pink pencil to my wish list and practice blending. Yana used a Sakura Classic White Bold Line 10 white gel pen, while I used a finer 05 pen, to outline the flowers. That made a big difference, as the white outlining on Yana's card is more pronounced. I ended up using Nuvo Crystal drops on the card as the gel pen looked too pale. If you are going to use a white gel pen to outline, get the Bold Line #10. I used Yana's technique to make the card, as shown in this video. It involves stamping first with dye ink, coloring, restamping with Versamark, and then embossing in gold. It's a labor intensive technique, but can yield beautiful results. I didn't have the Hero Arts set that Yana used and as soon as I saw her card, I wanted it. I still do, but I was able to substitute a larger floral set. I don't need every set I see (did I say that??). Prismacolor Magenta pencil; Polychromo white, magenta, light green, emerald green; Altenew Galactic Stream and Versamark inks; Altenew Botanical Gardens stamp set; Hero Arts Kind Messages stamp set; white and blue cardstocks from the stash; Sakura Classic White Pen #05; Nuvo Simply White Crystal Drops; Wow Superfine Rich Metallic Gold embossing powder. MOOD WHEN DONE: I'm getting a kick out of doing this series. In the past, I wouldn't have posted this card because it feels off. Now I'm learning and having fun. I hope you are enjoying it too. Stay tuned, as I have more cards inspired by Yana coming soon. What an interesting series! I enjoyed reading the steps you've taken through the process of learning versus just "CASEing". Your card is beautiful - your coloring of those flowers is lovely! Thanks! I am learning a lot. Glad you enjoyed reading it! I love how you think through things and am fascinated with these series you will be doing. I don't often look at others work because I end up feeling overwhelmed with ideas, so I am curious to see how it feels when looking at them for learning purposes rather than inspiration. I have found that focusing on one person and studying makes me more inspired, and not overwhelemed. thanks! I have tried Yana's coloring on dark cardstock and love it - mostly because it is so relaxing. 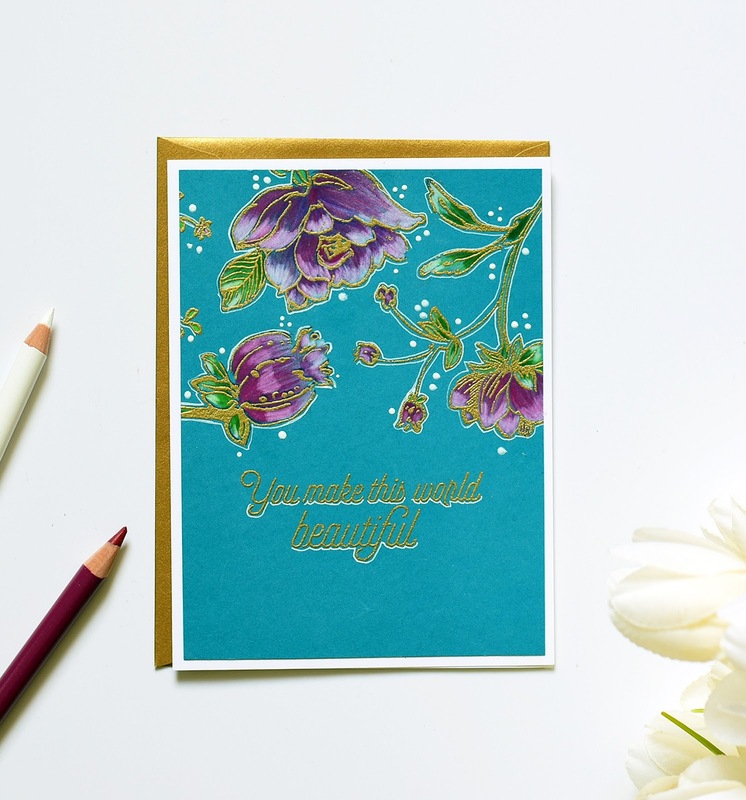 Your card is so pretty and loved reading about how you adjusted products and your learning process. When I spend so much time on a card, I find I don't want to send it except to someone who might appreciate it. Looking forward to more "Yana" cards from you. oooohhh...love this series Joan. Your card is beautiful. I've watched Yana's videos - she make darling, beautiful and stunning cards. She seems to make very good use of smaller elements for filling holes. She has an amazing sense of balance. Your card is quite reminiscent of her style. I can see where you are coming up with your points; but you should be happy with the card it is quite pretty. I love your take on this design and technique, Joan! And I love the purple! Prismacolors were my first pencils, but yes, because they break a lot I moved onto Polychromos. Also, I think I started with a set that was bit too big for me to "conquer" (I think I bought the largest Prismacolor set) and it was just too intimidating. With Polychromos I only had 36 pencils to start with and it was so much easier. Thanks again for sharing! I don’t know Joan but I think your card is every bit as lovely as Yanna’s. I think the difference in the spacing is she used smaller flowers. So, as in real like there would be more leaves. With larger flowers you have less leaves typically. Anyway I love your card and I’m loving the series so far. I'm enjoying your "learning series". It is very helpful to see and learn about balance, placement,color..etc. I agree with the others. Your card is lovely. I was looking forward to this series. There must be something wrong with me because I think your card is every bit as beautiful as Yana's, and I'm not just saying that. You learned a lot by studying Yana's card and you worked beautifully with what you had. No, you don't need every set you see. Very interesting reading and scrolling back and forth. I've been wondering about switching to flat photos. Lots to think about here. Never stop learning! Thanks Leslie. Flat photos seem to work better for me. I really appreciated your "Admired" and "Learned" lists — it's a helpful breakdown for comparison, analysis, and second-hand learning. I'm curious how you plan to fill the empty spaces between the images next time: smaller stamps placed closer together? the same large stamps with some smaller accent stamps in between? more dots and bling? You'll see in my next post how I use smaller images and pens to fill in. Thanks for reading! I really appreciate what you are doing with these cards and the series! I actually like your card more than the example card since the quality of the flowers is the focus and you bring that to the card. It's really really lovely! Such a great idea and cool way to learn and get better at what You want to create. I love the way you analyze each part you feel needs improving on your card, I shall try thinking this way when I take cardclasses, I always struggle because I feel I have to make my own thing too quickly. I hear you. We are all afraid of "cheating." This is a great way to grow without stealing. I agree with Leslie Miller. I've loved reading everyone's comments too. I think you've touched on a great series here! I am going to love this series. I have learned so much in this one post! As you did. Yay! thank you!! And hello back. We lived in Belgium for a few months a couple of years ago but didn't make it to the Netherlands. so disappointed to miss out on your beautiful country. Fun, fun, fun. I rank Yana videos right up there with Kristina Werner. They let you "watch" while they do the technique. I really enjoyed reading your post. I learned from your process and may join you as well. While I believe it's important to be reflective, I think you are too hard on yourself. For example, I think the larger flowers in your card needed the larger spacing. It's proportional. Anyway, thanks for the post. I look forward to see more. Yana Smakula is a great choice. I love her videos and I love what she does with those stamp sets that have multiple small icons. she creates great backgrounds and focal points with them. I think your card is beautiful. I like the colours and the use of the bigger flowers. The spacing looks great and they create a visual triangle. Great job! Thank you for sharing this wonderful idea and your observations.